India won the gold medal after defeating England 3.5-0.5 and emerged victorious in the Youth U16 Chess Olympiad 2008 in Turkey after their triumph in World Junior Championship, confirming the good performance started by IM Harika and GM Gupta a few weeks ago at the World Junior Championships. The important game of the last round was between Russia and Azerbaijan. Vasif Durarbeyli defeated Oleg Yaksin on the second board, Anastasia Bodnaruk and Ilia Iljuishenok defeated Mammadov and Kazimova, but the 2,5:1,5 overall victory was not sufficient for the top seeds to win the gold medal since they were surprised by India who defeated England with 3.5-0.5. Philippines defeated ISEM 3-1 to get the bronze medal. 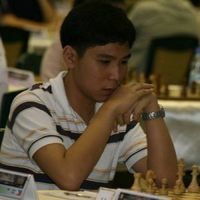 Despite the last round suprising draw with Zeytinoglu (1883), GM Wesley So was the key to Phillipines 3rd place. The young talent managed to win the gold medal at board 1 and to add yet another 15 ELO points to his rating in his chase for the 2650 barrier (after breaking the 2600 a month ago). Full round by round reports can be found on the official site.